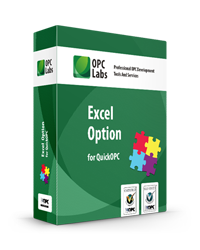 The Excel Option for QuickOPC allows you to set up a communication link between Excel and any OPC server. It is possible to subscribe to and view real-time data, and also write the data back. No programming, macros or add-ins are necessary. With just drag-and-drop or copy-and-paste, you can create Microsoft Excel sheets with live, animated OPC data.